Boasting beautiful refurbished rooms, a first-rate events center, and the best location in all of Sonoma, the Best Western Sonoma Valley Inn & Krug Event Center is the perfect spot for a Wine Country getaway, a wedding reception, or a business retreat. Our clean, spacious rooms feature crisp linens, fresh carpeting, and huge televisions. Enjoy top amenities like satellite cable, stereos, refrigerators, in-room safes, hair dryers, irons and ironing boards, and free high-speed internet. Select rooms have fireplaces and balconies, and business rooms have well-lit oversize desks. Start your day right with a complimentary newspaper and free breakfast including hot and cold items. Stay connected in our business center and recharge in our exercise facility. Cool off in our heated outdoor pool or relax in the steam room. 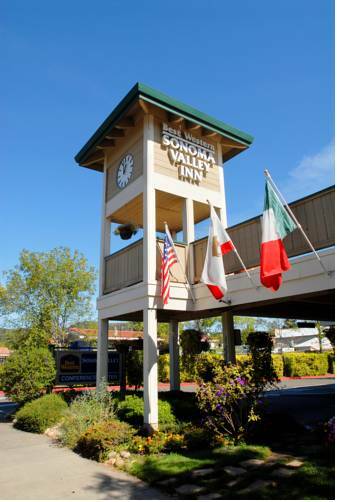 Our Sonoma, CA hotel is the perfect spot for events. The Krug Event Center can host up to 150 people in one large configuration or be used as three smaller rooms, and we also have an outdoor conference patio with room for 50. Youll be close to the action here the hotel is just steps from the historic Sonoma Plaza, which is lined with cafes, galleries, and wine bars as well as several of the centerpieces of Sonoma State Historic Park. Cellars, coffee shops, and trend-setting restaurants can all be found within a few blocks of the hotel. Sonoma hosts events year-round, such as the NASCAR Wine Country Classic, NHRA drag races, the Sonoma Shakespeare Festival, and of course a long list of wine and food festivals. Our English and Spanish-speaking staff looks forward to making your stay or event a memorable one. Book today! From: San Francisco. Take US 101 North to Highway 37 East towards Napa/Vallejo/Sonoma, turn left on Highway 121 North to Highway 12 towards Sonoma. Follow Highway 12 into Sonoma and make a left turn on West Napa Street to the Best Western Sonoma Valley Inn & Krug Event Center. From: Santa Rosa. Take Highway 12 towards Sonoma, continue on Highway 12 into Sonoma and around the left hand curve as Highway 12 turns into West Napa Street, turn right to the Best Western Sonoma Valley Inn & Krug Event Center.